Plan: follow horse then draw. I'm not reading her mind, she's reading my mind. Follow... lead... follow -- not "drive" but follow. Horses do really well when the human is sure about what they want the horse to do. Letting the horse run into the end of the rope teaches a horse to expect pressure, to wait for pressure before responding. Accepting "no" from the horse. Set horse up to succeed - mentally and physically. Regarding "firm up and wait" business, all it does it teach a horse to wait for pressure. Shared intent, feel. Story about mural in St. Louis of horse lead by string by women. Be sure. Hold thought long enough for horse to be sure. To make it clear especially with a stuck horse, both hands on one side of face, in one eye during change from leading to driving. If we don't experiment too quickly, it gives horse the chance to experiment. Trailer loading: interest in trailer. Knowing how to get out of trailer with ease. Practice trailering ahead of time will make it so you can count on the horse loading. You are only able to deliver what your experience has been -- dictated by how you were raised to feel about yourself. Release horse forward, not chase. 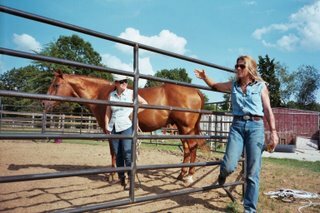 Leslie worked on changing the horse's expectation of the human -- that way the horse can deliver. One basis of a good ride is having the front end connected through a float. If you've invested pressure, you'll get pressure in return. Horses need flies to keep them fit when it's too hot to ride. Leslie observes horses, doesn't try to pretent to be a horse or label any horse as lead or dominant, etc. Use the horse to learn everything you can about being human. Training routines create bored, tuned out horses. Power - from strength and clarity versus fear and doubt. Problem: delay between ask and response. Feeling like I'm talking throught molasses at times. When to say "NO", when to say "OK I'm going with you", out on trail. Working with the space gives meaning to the float. Crowding and push/pull with head and halter creates heavy front end. You are not going to get the withers up unless you can control the head, the neck, and the shoulder. Feel that reflects an accurate intent. Don't need to be aggressive or angry, just clear. Being dependent on praise: as much as I am dependent on external praise, I will assume others need praise and offer it which, if they don't need it, it's an intrusion, an insult, to give it. Presumptious. I'm not looking for a new way to teach my horses, this is not about teaching them something. It's about asking, waiting for answer, and hoping to help the horse find the float. Friday PM: PG said it looked like I knew exactly what I wanted the horses to do. I responded: when I was really focussed, I hardly knew where the horses were, simply that this area in front of me was clear of horses. Sunday AM: I came to be reconnected to some ideas I was introduced to before. Ideas I've tried out then lost sight of amidst the input of other clinicians. But ideas I was eager to retrieve, to find again, because parts of my horse handling had gotten harsh, in my opinion, with my impatience and my idea that I can do this or that to make my horse do this or that... I really like what happens for the horses Leslie relates to. I want to do whatever I have to do in order to be in a frame of mind to want this more than anything. Back: lift on halter knot under chin to elevate. Use body moving into space to move horse.